Just over 2 months ago I was seriously and realistically considering walking away from acting and improv. Maybe forever, maybe for a year or two. It hurt. It hurt so much. Death of a dream and all that. I cried a lot. I couldn’t stop. It felt horrible. And I prayed a lot. That felt horrible too. I said, I can’t keep on like this. I hurt too much. I’m not strong enough. I’m breaking. I feel it. Like a brittle tree I just can’t bend any further, I’m splintering. I’m not sleeping. I’m not exercising. I’m not writing. I’m working and working and stressing and being sick. I’m all worn-out. And I can’t keep doing this. I have no hope left. I know not everyone reading this is a Christian and I don’t give a damn if you believe me or not but God answered me. Not then, no movie moment. For over a week I was there. For over a week I sat in my own sadness and I looked, really looked, at my goals and ideas and I realized that I was trying too hard. Which is weird. Because I am normally all over myself for not trying hard enough. But in some things it’s the letting go that matters. And I’m very, very bad at letting go. I realized that I wasn’t going to get everything. That hurt. And I realized a lot of other things that generally made me feel even more miserable. Then I made myself go out to an event a friend had invited me to, get out of the house. I was still raw and still scared and still looking at walking away from it all after that run of classes was up. And feeling very anti-social. That night I had a random, unplanned, completely chance in the sort of way that’s impossible to imagine, encounter with someone who works in the film/tv industry. She said I was perfect for a role she was casting. Absolutely perfect. As she blindly listed off several things that made me perfect for it (and handed me her card- this was a major house here in Chicago) I just stood there. The things she was listing off were some of the things that were preventing my success. Some changeable, some not. The audition never happened- the role was cut. It was God. And it was hope. And it was a relief. Not a promise. I might never, ever get a single role. I might never act in anything. I might never sell a script or produce or ever make any money whatsoever from anything related to theater or film or tv. Hope. That was all I needed. And from that came a realization that I didn’t say anything about because it’s easy to have a revelation that only lasts a few days and fades. But it’s been 9 weeks since that night and it’s stronger now than it was then. I am the thing in my own way. I am what’s been holding me back. Just, not in the way that I thought. I realized that weekend- in between when she gave me her card and she emailed me Monday to let me know the role had been cut- that I had never once actually believed that was possible. I held her card and I had the realization that despite my occasional fantasies of making a living at writing and acting (these are tied together in my head), I never actually believed I could do it. Yeah, I’d daydream about being interviewed on late night shows or flying to Europe to film but I never BELIEVED it. As much as I wanted it I never once thought it was possible. If you’d asked me, do you think you can make a living writing for tv?, I’d have said, yeah- of course. And I believed that. I thought I believed I could do it. I held that card that weekend and I felt something inside me wake up. It uncurled out of the bottom of my mind and only once it was there did I realize that it never had been before. Actual, real belief. That this is possible. I actually, really, truly, fully, believe that for the first time. It’s always been “I want to” and “I’d love to” and “I wish” and “One day” and “Maybe” and “If I can”. That’s how the voice in my head talks. For the past 9 weeks it’s been “When I”. I hear you. I know some of you well enough to imagine that look in your eyes. The one where you want to be encouraging but you know that it’s easy to talk and hard to act. I get that. That’s why I didn’t say anything right away. That’s why I’m debating writing this now. Hell, I didn’t realize the difference right away. It took a few weeks before I realized that the shift wasn’t emotional. I mean, it was in the moment it was filled with emotion. But my emotions have been all over the map since then for other reasons and this, this whatever it is, hasn’t shifted. It’s not a feeling. It’s… a worldview? Lifeview? I don’t know. It doesn’t need a name to change me. I’ve believed for years that I didn’t have emotions. And even when I felt them, deeply, I convinced myself otherwise. That I was defective. Actually, I learned (somewhere) that I wasn’t allowed to take up space (mental, emotional, physical, relational). So I didn’t. I decided that weekend to try to enjoy what I am doing instead of freaking out over what I am not doing. Ultimately, none of this is going to make or break anything- it’s just what it is. Nothing more or less. With the belief that I what I want is actually possible I’ve quit fighting for it. Told probably a hundred people that I’m a writer and/or actress. Without qualifying it or apologizing for it or rushing to assure them that I know how ridiculous it is and I have reasonable descriptions of myself too. Admitted to someone that I thought her goal of running play seminars as a living was amazing and something I loved. Which I would have done before. Then I basically added, “Let me know if I can help you. I’d love to do something like that, and I’d love to work with you sometime.” Now, it wasn’t that straight-forward in the moment but I still marveled at my boldness that night as I lay in bed. Had several exercises in Meisner class where I’ve had genuine emotional responses. I mean, really felt something. And SHOWED it. I cried. In front of people. And got angry. Really angry. I sent a scene partner scuttling across the room because I scared him so badly. That felt good. And then I said, “that felt good”. To my class. So impolite. Which felt even better. Signed-up for the two writing classes that I moved to Chicago almost a year ago to take. That I’ve been too scared to take because, what of I screw them up? Had an authentic emotional scene in an improv class. Improv. I was sad and scared and upset. It was the sort of thing I always thought wasn’t for me. Out of my reach. Got a huge laugh in the same class. Without trying. I half derailed the scene where it happened because it startled me so much. I’ve always seen myself as the one who doesn’t really get laughs. And, that’s been true. I don’t get tons. Didn’t. The last 3 weeks I’m getting a fair share. Finished, and posted, a fanfiction story I started 8, yes 8, years ago. Auditioned for a big, audacious improv show. I got a callback. I’ve never, not one time, gotten a callback for a show. And now I’m in their 3 week intensive audition process. It’s going well. Asked for permission to enter an acting class out of order. And I got it. Signed-up for and am currently attending at out-of-state improv intensive. Quit a job that I hated. I just quit. I didn’t wait until I had the excuse of another job or a move- I quit because I was miserable. No other reason. I took a proactive step to care for myself. Which felt real weird. That post 9 weeks ago led the way to all of this because it made me SAY what the problem was. And then ask for help. And then I got help. I’m still marveling over that. This week was an overall bad week, but it ended on a great note. Bad, because I barely wrote. And when I say that I did still make a gain, I got out of the hole a little. Just not much. Not enough to catch up on time. It is good to remind myself that a few months ago just breaking even was a big win. However, it’s also good to remind myself that, due to letting myself get so far behind, that isn’t going to cut it. I have to write regardless of what’s going on. Having said that- I’ve been sick. I’ve felt horrible, completely drained and just wanting to sleep. Coughing hard enough that my roommates can hear me through the walls. Plus I went onto regular hours at Target so I’m getting used to having a job again and writing around that has been difficult. And it’s not helping how tired I feel. It was far too easy this week to curl up and watch Netflix while dozing instead of writing. However, there was a bright spot at the end. Monday I, for the first time ever, had a 10,000+ word day! In fact, it ended up being 11,000+ when it was all said and done. Which when you look at the numbers below will let you see how weak the rest of the days were. Still! I did it. It as more a mental block than anything. I’m capable of doing it, I kept saying I was going to, but never actually making it. And I hate to say this because it only reveals how easily I could have kept up but- it really wasn’t that hard. Time consuming, sure. I wrote a total of five and a half hours. I did nine, thirty minute blocks on Avon and then about an hour to hand write my MPs and journal (baby journal entry). Not including the very much needed breaks. But not hard. Not physically difficult, not torturous. It just took a commitment to sitting still and doing it. That’s what it comes back to- doing it. Just sitting down and writing. Even when I’m sick. Even when I’m tired. Even when I have nothing to say. That’s been one thing that improv has done to help my writing more than any other thing. It has taught me to keep going in the face of having no idea where I’m headed. I can’t stop in a scene and try to figure it out. There is an audience watching. I have to go on as if I know exactly where things are headed, as if I have secret knowledge. It’s the same with writing. If I want high word counts, if you want high word counts, the secret is to write. Ha! There it is. I’m a genius. Really though, just write even when there is no story coming out. It will show up. Humans are made to tell stories, to make connections, to seek and find patterns. I can’t tell you how many times I’ve just written words that technically went together but I had no point for that ended up being vital to the story. By that I mean, don’t write random words like “dog hard noise love lion” (unless that’s your thing (And I think I can find a story in that, actually)). But just write words that would normally do together “She saw a tree. It was green. It was tall”. Does it sound like a preschool book? Yeah. But you have no idea what it will lead to, and there is always editing later if it doesn’t go anywhere. Yesterday was one of those days where I forced myself to go to the drop-in class at iO even though all I wanted to do was sleep. I was rewarded with an experience I’ve never had on stage before. Several of the students wanted to work on acting/realism so that was our focus. I had this moment where I was squared off with a guy and we were just looking at each other, trying to let whatever was already there bubble up and build something from the natural feelings without judging them or trying to categorize them. So anyway, we are doing that and Lyndsay was giving us a lot of side-coaching. Telling my partner to breath and to quit fidgeting, that he was defusing all the energy that needed to come out as an emotion through moving around. The same note she gave me several times when I had her during the intensive. So I took it as a note for me as well and doubled-down. Forced myself to stand perfectly still. Both feet flat on the floor, both hands flat on the sides of my legs, no swaying or nodding or chewing on my lip or anything else that would let me move around. It was freakin’ hard! But I had the chance to work on it because she was talking to him. So I kept staring, and kept forcing myself to be perfectly still. As we finally started talking I wanted to move. Very much. Then I opened my mouth to say something and the urge to move was so intense I felt like I simply couldn’t hold still another second. So I blurted out something instead. I just opened my mouth and words came out that I didn’t expect, that I would never have said because they didn’t make any sense. But it was that or move and I’d already decided I was NOT going to move. I couldn’t say what I’d planned, to further the story, because that would have meant moving. I think Lyndsay would say that it was because what I planned to say wasn’t honest to the scene, so I wanted to shift around to defuse that dishonesty. Like a little kid. He blinked. I think I surprised him too. But as soon as I said the unexpected words I felt this rush of energy sweep through me. In that moment, when I chose to not let it out any other way, the reward was stunning. I’ve never like that on stage. The rush lasted the rest of the scene. I was buzzy, electric, with energy. I felt dizzy with it. I kept going with what we’d already started, I didn’t have to think about my answers. I felt like I had control, in a good way. Like, even if he had flipped and done something unexpected I could have held onto my own stuff. Something I tend to not do. I’m not sure where the balance is in this. I can’t simply stare down everyone on stage without moving. And I tend to come off as nervous quite often, that’s where my energy seems to come from. So I need to figure out how to get that sense of power even when I’m moving or gesturing. Last night I sat down and wrote up an “outline” for a story. I put outline in quotes because I don’t typically plot books ahead of time so compared to the average book outline this one is sorely lacking. 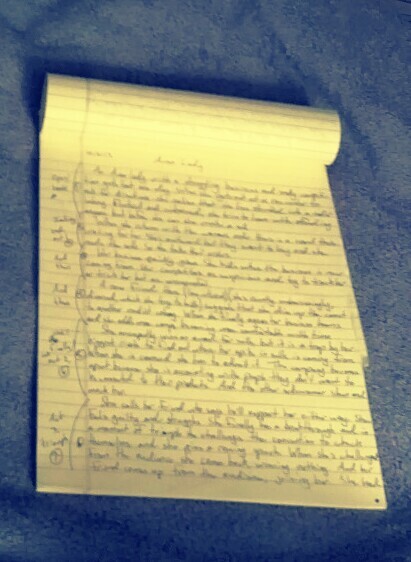 It’s just over one legal pad in length and it hit all the main ideas I have for the story. I wanted to jot down the high points before I forgot them, I wasn’t trying to create a plot. This morning I was looking at it and noticed something. I grabbed a pen and five minutes later I was staring at the page in shock. I’d written a perfect story arc. Without trying. Upon further inspection I found that Act 1 has a positive ending, Act 2 has a negative ending, and Act 3 has a positive ending, which is much higher than the positive end to Act 1. Which is also textbook (by which I mean Story, by McGee). Somehow, somewhere, without me noticing, structure has slipped into my brain! I crossed the quarter million word mark! This is a happy day. This week I earned money for doing improv for the first time. It wasn’t a lot, and it’s not even a big deal, I have a lot of friends who routinely get paid to do shows. The point was I realized it was the first time I’ve ever been paid for any kind of creative effort. I got paid to make things up. What a weird and amazing concept. Tonight I printed out my book, working title is Temps, at Office Max. When the man helping me walked over I thought he had picked up a ream of paper to refill the machine. Then he sat it down in front of me and asked for my money. I stared at him, deer in the headlights. My naive idea that it wouldn’t be too hard to do this thing was destroyed tonight. I knew it would be a lot of pages. I didn’t know it would be stack heavy enough to kill someone if I drop it on their head. Last night at my musical improv class I was part of a scene that worked. I mean, it was funny and it held together and it was fun for everyone (me, partner, audience). It was one of those rare moments where everything falls together and it just is. It’s a great feeling. I think one of the reasons I’ve stuck with improv is that it can happen anytime at all, no warning, and yet there’s no way to make it happen. It’s always a gift. In the past when I’ve had those moments, times that I’ve realized I actually just did decent work and it all came together and it was fun, there has been a feeling that I wasn’t making choices or thinking. I was just doing and it was right. And that’s remarkable and wonderful and intoxicating. Last night, however, was different. My mind was moving fast. There was no sense of being out of control or of just going with it. Quite the opposite, in fact. I was making choices and thinking out options. “Oh, I need to match his character right now. A peg leg suits this scene. He’s just shown that’s dusty, I should sneeze. Dropping a coin down the hole will be funny but not distract from what he is saying.” On and on like that. For me improv has always been one of two things. Sometimes, 95% of the time, my mind is spinning with all the things I need to do and tensing up in panic. Trying to keep all the improv balls in the air, trying to remember all the things I’m supposed to be doing to make this thing work, and knowing that I’m dropping things because I can’t keep watch on all of them at once. About 4.95% of the time it is me deciding to ignore all those things and “be in the moment”, which tends to go even worse and leads to me ignoring my partners and being utterly boring and not making any choices. About .05% of the time are those rare scenes I mentioned before, where I’m actually in the moment and it all comes together without thought. Having my mind going 90 to nothing and yet not being consumed by the thoughts was a weird experience. It’s hard to put into words. There was no self-consciousness, no sense of judging what I, or he, had done, and yet a complete awareness of it. There was no franticness to the scene, but it didn’t drag either. I felt like my mind was in two parts and one part was feeding ideas and choices to the other part, which did them. I just realized as I was writing those words- this is the first time I’ve felt like I was juggling all the balls. Not all the improv balls there are, goodness. But all the ones I gave myself. I’ve been doing improv for 21 months now and I’ve been frustrated because I’ve yet to have that “ah ha” moment that comes along when you are learning a new skill and you suddenly realize you are doing it instead of thinking about doing it. I had that last night. For the first time I was holding onto a character (voice and posture both) and doing space work and adding to the scene and listening to my partner- and I was doing it all by making active choices yet not realizing in the moment that I was making them. Choose an emotion to feel as you enter the scene. Allow that emotion to influence what you do. Example- I choose angry, and let myself feel angry. That leads to walking stiffly, breathing heavy, and knocking over a chair to make a point. Chose a posture to hold as you enter a scene. Allow that posture to influence how you feel. Example- I choose to walk stiffly and breath heavy, knocking over a chair as I enter. That leads to me to knowing that I feel angry. Both work. I’d say that great improvisers use both, but everyone has one that works better for them. I didn’t understand the second method when I heard about it and so the only method I thought I tried was inside-out. I did outside-in exercises in a class I took but I didn’t understand that you could use that to make a character, I thought it was just to practice showing the emotion you had already decided on. Then I took a physicality workshop in December and he talked a lot about the second method, of doing things and seeing where that leads. He then had us do an exercise I’d done several times before, leading with different parts of the body. For the first time I understood the point of the exercise; as I shifted from leading with my head to my hands, or even from my eyes to my chin, I could feel the character change, and also the feeling behind that character. More though, for the first time I understood that you could use that in a scene. I didn’t have to try to feel sad, I could just look sad and do what a sad person would do. Then I’d be sad. I am definitely an outside-in sort of person. I typically sit down and work on my goals list twice a year, using that time to review the last six months, but the review in December is always a little more in-depth. It has less to do with the January 1st craze and more to do with my birthday falling into that week between Christmas and New Year’s, I’ve found that turning a year older prompts me to consider my life more deeply and it just so happens that it occurs in conjunction with the new year. Anyway, I’d already finished my new goals for 2012 before I read this post but I liked the questions he asked so much that I did the review anyway- they made me think. I’d recommend going through it now, especially if you didn’t take the time already to think about last year. For me, it’s not “making resolutions”, as I said, I set goals twice a year. But reviewing the previous year helps me to see what did and did not go well, and reveals if I am actually getting any closer to some of the big things I want to accomplish in life. After doing the entire review I reread it and noticed something interesting. But we’ll come back after I show you the first question: The 10 Greatest Things That Happened To Me In 2011. This involved a Southern woman tackling a 1,500+ mile road trip in the snow, white-outs, a visit with good friends, and frostbite. First time I’ve been a member of a church since my teens, a scary/exciting step for me. Sonia and Crystal– y’all rock! Fear alert! This was/is the scariest job I’ve ever had. Also the hardest and yet most fun. After a fashion. Things turn out, but they don’t always match the pictures. It was an Improv-A-Go-Go show at HUGE, and it was not what I expected. Three of the four groups did not impress me and I likely wouldn’t have gone back if not for the fourth. So glad they were there! I LOVE improv! I’m taking classes at HUGE and ComedySportz. Yes! And it was fun! And I just got my first ever rejection letter when I tried to sell it! Now I feel like a real author. And it was lovely to see my whole family in one together for the first time in a long time. I was looking through that list when it struck me- I didn’t consciously put only things I actively did on there but that’s how it worked out. The greatest things of 2011, the things I most enjoyed or that most changed my life, were all things I choose do to. None of them just happened to me; every one of the above items took effort and time, and most cost money to boot, which meant more time and effort to get said money. No one is going to hand me an awesome life. Do I receive gifts? Of course! All the time. And all of these things involved other people. But none of them would have happened if I hadn’t put effort in as well, in some cases a lot of effort (example- calluses from both knitting and writing so much). My list of things to do this year is longer and more ambitious than last year, though tempered with the knowledge that life changes so quickly. Example? This time last year I was still living with my parents in TX, no job, no church, a ball of yarn that I couldn’t even get on the needles, and I’d never even considered going to watch an improv show. There’s no way I could have foreseen where I’d be now and some of the goals I set last year were derailed along the way. That’s ok. I’d rather have goals and have to set them aside for more interesting things that come up than to wander aimlessly around and get very little done because I don’t know what I’m going after. I urge y’all to go to this site and download his 2011 review, then take 30-60 minutes to fill it out. It’s well worth the time.